Man, I really dug one up from the archives! I found this while I was cleaning out my art supplies. It's an illustration I did in 1991 when I took a night course at Rhode Island School of Design in children's book illustration. My books had just been published (without my illos!) and I wanted to see what I was doing wrong. Anyhoodle, the assignment was to draw our version of Mother Goose. I pictured her as a hipper version riding a carousel goose. This isn't really a very good scan because the piece is laminated. I must have used it as a placemat or something rather than throw it away! 1991 seems sooo long ago, i love mother goose and have told her stories over and over to kiddies. hugs. I'm glad you found it, it's adorable!! Your picture makes me want to be a kid again! It is so magical! Love the stars! Great job love the goose. I like it! Both as an illustration but simply for the chunky shapes. You keep finding clever things you did and do. I was fast off the blocks today because the IF word was almost 2 hours earlier. I'm thinking about you out there and wishing you the very best. Go back and see my new dog cartoon below the IF image when you get a minute. Anyhow, hope all is well on your end and you have a splendid weekend. 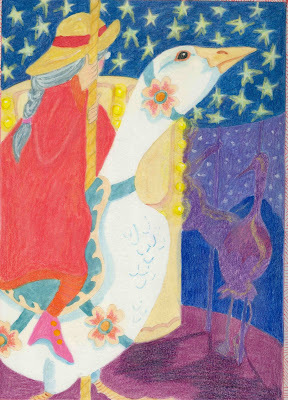 I love the starry night background and the cheerful mother goose.